Almost 80% of Social Security disability claims are denied on their first attempt. With the majority of people receiving rejections, they will then go on to appeal the rejection and possibly face a court hearing. If you have to face an administrative law judge in court as part of your appeal, it is crucial to properly prepare before the hearing. To make sure you are fully prepared for your Social Security disability hearing, you need the advice and assistance of a legal professional. 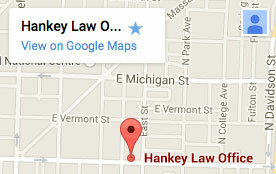 At the Hankey Law Office, our Indianapolis social security disability lawyers are dedicated to helping you fight for the financial benefits you need to stay afloat during your period of disability. To schedule a free consultation with one of our experienced attorneys, call us today at (800) 520-3633. Additionally, an experienced attorney can help you prove your case for the benefits you deserve. If you have had your initial disability claim denied, you need an experienced attorney to help you fight for the benefits you need. Contact the Indianapolis social security appeal lawyers of the Hankey Law Office today at (800) 520-3633 to learn more about how we can help.